The work of Jody Hill is an acquired taste. His last series, Eastbound and Down, teamed him with frequent collaborator Danny McBride for a four season run on HBO. That comedy played to both Hill and McBride's strengths, delivering the same sort of cringe-comedy they had seemingly mastered with films like The Foot Fist Way and Observe and Report (though the latter didn't star McBride). The pair excels at telling uncomfortable stories about men in places of privilege or minor authority and how frequently those elements are tested as they continue to establish a petty need for dominance and push for more. The duo might have found their strongest (and sometimes most cringe-inducing) example of this theme in Vice Principals, which, with its season 1 finale, continues an exploration of ego that was taken to an unlikely extreme in the season's second episode and has attempted to return from entering the fringe ever since. In crossing such a massive threshold so early in the season – i.e., burning down the house of Principal Belinda Brown (Kimberly Hebert Gregory) an African-American woman in a position of authority – the series has felt ungainly at times as it turned inward and found itself more interested in its two leads' – McBride and Walton Goggins in a terrific performance that has proven to be the antithesis of his career-defining role as Boyd Crowder in Justified – budding friendship and sense of loyalty to one another that supersedes their professional interests at the high school where they both work. Uncomfortable as the series has become in some aspects, it has shined in others. The best example of this may be a string of midseason episodes that made for an entertaining diversion from the series' apparent conceit and gave both McBride and Goggins several moments to shine. A standout would likely be Russell's troubles at home being magnified by the extreme alpha male-ness of his neighbor Jackie (Owen Harn, Quarry), whose efforts to emasculate Russell turned violent and ended with more violence when Gamby showed up to save his friend. That moment and many others appeared to mirror or offer commentaries on a state of male disenfranchisement and the political divisions in this country right now. As such, this makes the question of whether or not Vice Principals has deliberately set out to make this what the series is about unclear, but the comparisons do make for compelling discussion about narrative intent. But the vast majority of that discussion is certain to be put on the backburner after the season 1 finale, 'End of the Line,' concludes with a bloody, out-of-left-field cliffhanger that left Neal the victim of a shooting he may or may not have been the sole target of. To be fair, violence isn't really something that's out of bounds on this show, but the level of violence and the location where it took place raises the same sort of questions about the show's intent that Neal and Lee's attacks on Dr. Brown did. Vice Principals strikes a strange balance in its final moments by introducing a masked stranger with a gun to shoot Neal after presumably setting his and Lee's cars on fire. It reads like the sort of extreme comeuppance a character like Neal would have earned given his actions throughout the season. The strangeness, however, comes from the question of how the audience is supposed to feel about such a thing, and whether or not the event is to be read as anything deeper than a surprising cliffhanger that puts one of the series' main characters in serious jeopardy. Before that discussion can even begin, though, there is the question of who actually committed the shooting and what events from the first season it was motivated by. Certainly, with Neal and Lee succeeding in their pernicious plan to depose Dr. Brown, she would be the likeliest suspect – either performing the deed herself or getting someone else to do it. That doesn't seem to be something her character would do, but, then again, it didn't seem like Neal and Lee would set fire to a stranger's house simply because they were displeased about being passed over for a position they felt deserving of. In other words, Vice Principals has demonstrated the depths to which its characters will sink in order to achieve their goals, and given the consistency with which the show has made that clear, it wouldn't be outside the realm of possibility for the show to push the character of Dr. Brown to such an extreme – unlikely as it may be. On the other hand, the same can be said of almost anyone Neal wronged throughout the first season. The list of possible suspects is a long one that starts with Neal's new best bud and co-principal Lee Russell. Beyond that, though, you'd have to include Bill, Jackie, Ray, Gale, Ms. Abbott, or any of the kids Neal yelled at and humiliated throughout the last nine episodes. Even then, the identity of the shooter is going to prove as shocking as the shooting was. Perhaps, then, that's what the series is really interested in exploring: how increasingly unsurprising it has become when actions are repaid upon their transgressors (perceived and otherwise) in horrible fashion. In other words, in its first season, Vice Principals seems to have started a pretty complex conversation and it's not entirely clear what it wants to do with it. Beyond finding out whether Neal lives or dies, or the identity of the shooter, it will be interesting to see where Vice Principals goes in its second (and final) season and what parts of the larger conversation it's started will be explored further or left where they are. 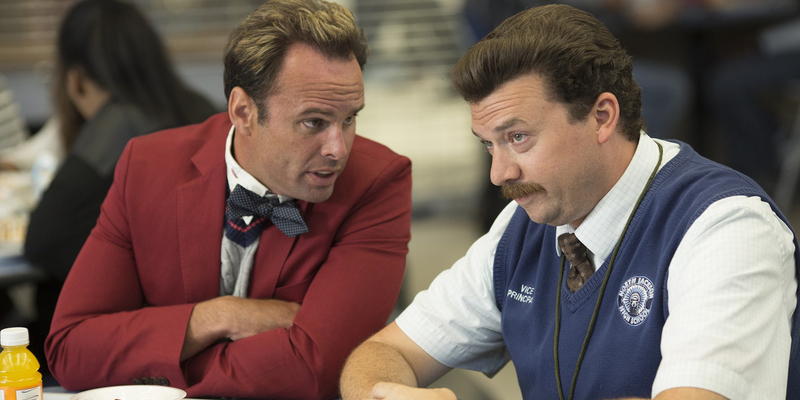 Vice Principals continues with season 2 sometime in 2017 on HBO.